In August 1997 my immune system went haywire and began killing my adrenal glands. One of the quirks of Addisons Disease is we can’t retain sodium, so we take medication to help us retain it, along with eating a high sodium diet. Soup is my comfort food and usually a good source of sodium. I eat so much of it, my friends have dubbed me a “soupaholic”. 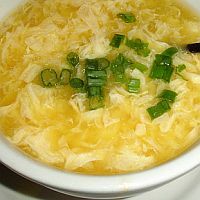 I recently came across a recipe for egg drop soup on Pinterest and made it for the first time yesterday. It was really good, but almost to salty, even for me. If I say something is too salty, then it’s salty! As normal, I played around with the recipe today and made it, in my opinion, even better. One change I made was to use fresh garlic rather than powder. Garlic is a natural adrenal booster and I crave it as much as salt on a regular basis. Mince 3 cloves of garlic & sauté in just enough olive oil to prevent sticking. Bring to a boil & simmer for 15 minutes. Remove from heat. Beat 2 eggs and slowly stir them into the broth. Cover and let stand for about 5 minutes. Photo was taken from the Internet.